The image of marriage that we are advised to strive for as portrayed in the Qur’an and Sunnah is based on three foundations: taqwa (consciousness of Allah SWT; love of pleasing Him and hope for His mercy, which is balanced by fear of displeasing Him and earning His wrath; virtuousness), mawadda (abundant love), and rahma (mercy). Taqwa guides the practice of abundant love and mercy as will be explained in more detail. 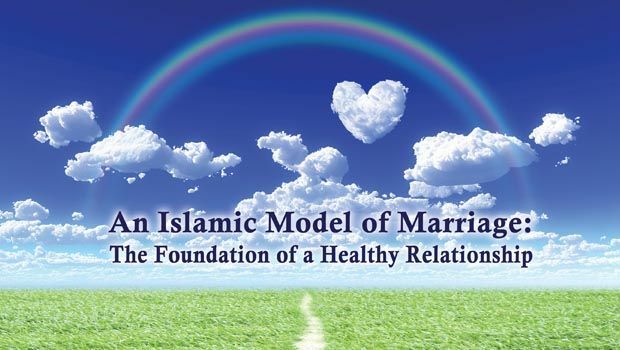 We can experience paradise on earth if we really strive to live the Islamic model of marriage. Let us begin by exploring taqwa and its importance in marriage. If we are asked to choose one trait that is essential for marriage, our unequivocal answer should be “Taqwa!” Taqwa emanates from the heart and envelops the whole of the human being. In fact, it is the core foundation from which love, mercy, and caring flow. There are many reasons why taqwa is essential to the success of marriage. Many marital issues in Qur’an and Sunnah are left open to the application of ma`roof, i.e. in accordance with Shari`ah (divine law), justice, fairness, respect, equity, caring, compassion and kindness. Ma’roof also encompasses what is Islamically customary, such as issues of obedience, gender roles, divorce, maintenance and provisions, or even the simple act of just living together as spouses. Only inner God-consciousness, taqwa, guarantees that couples fulfill their marital duties and apply the principles of Islam as justly and as fairly as possible. “…They are your garments and you are their garments” (Qur’an, Al-Baqara, 2:187). The word garment conveys feelings of warmth, closeness, protection and security. Taqwa of Allah (SWT) is the only reason why a person in his/her sane mind would counter evil with good for fear of transgressing and in hopes of high rewards from Allah (SWT). Abu Huraira (RAA) narrated that the Messenger of Allah said: “…do not hate one another; do not turn away from one another; and do not undercut one another, but be you, O servants of Allah, brothers (and sisters). A Muslim is the brother of a Muslim – he neither oppresses him nor does he fail him; he neither lies to him nor does he hold him in contempt. Taqwa is right here” – and he pointed to his breast three times” (Muslim). The Prophet (SAW) is pointing out that taqwa is the safeguard to help stay away from the evil behaviors he mentions. Taqwa means putting our trust in Allah (SWT). By trusting and following Allah’s (SWT) commands, we can ensure a successful marriage in this life. With taqwa we can trust that fitra (pristine human nature), common sense, and goodness will rise above egoistic tendencies for conflict, power seeking, and vengefulness. Taqwa empowers us to live in harmony with our spouses. We may have come from homes where verbal or physical abuse was accepted and regularly engaged in. However, it is not befitting or acceptable for someone with taqwa to follow in the footsteps of such ugly behavior. Both spouses raise their standards when they practice taqwa. Taqwa is the best garment one can wear, whether during marriage, parenthood, work, or any other aspect of life. “…But the garment of righteousness [taqwa], that is the best. Such are among the Signs of Allah, that they may be reminded” (Qur’an, Al-‘A`raf, 7:26). Only a person clothed with taqwa will be a comforting companion and a merciful friend. Such an individual becomes a cover and shield for his/her spouse in full embodiment of the following beautiful verse: “…They are your garments and you are their garments” (Qur’an, Al-Baqara, 2:187). The word garment conveys feelings of warmth, closeness, protection and security. It is interesting that the root meaning of taqwa includes to safeguard, to protect, to preserve, to shield, to shelter, and to prevent. It is easy to see why taqwa is the perfect garment for the two individuals in a marriage relationship. Let us look at the following verse: “And among His Signs is this – That He created for you mates from among yourselves that you may dwell in tranquility with them and He has put abundant love and mercy between your [hearts]. Verily in that are Signs for those who reflect” (Qur’an, Ar-Rum, 30:21). Allah (SWT) establishes a beautiful image of an amazing bond between a man and a woman; one of closeness, shelter, warmth, and abundant mawadda (love) and rahma (mercy). These two Arabic words encompass many meanings. Let’s look at each one more closely. In the verse above, mawadda is best defined as abundant love. Couples need to gather and increase their provisions of love, lots of it, to keep the ship of their marriage sailing. Abundant love encompasses many meanings such as affection, appreciation, attention, commitment, joy, respect, responsibility, sacrifice, security, trust, and intimacy. For the marriage to be happy, enduring and fulfilling, couples need to engage in the continuous exercise of loving and nurturing each other. If we do not nurture our marital relationship daily, it withers and dies like a plant without water or sunlight. Loving each other on a daily basis is about feeling close, connected, individually and mutually fulfilled and appreciated. At the heart of many marital problems is a poor perception of a spouse, which usually involves our focusing on the other’s shortcomings rather than on our own, letting negative thoughts run wild and building a mental case against the worst aspects of the spouse rather than building an emotional support system for their best aspects. There are unlimited ways to demonstrate love, affection, and caring toward your spouse. Tell your spouse frequently how much you love him/her. Loving your spouse is not just about realizing this in your heart but also about telling them. The Prophet (SAW) said, “If any of you loves his brother, let him tell him that he loves him.” This applies to family, friends, fellow Muslims, and most significantly, to spouses. You can call your spouse during the day or send him/her an email checking how things are going. When you call, tell them you miss them or any other sentiment of your choosing that expresses affection and appreciation. In fact, giving a gift of appreciation has great impact. This does not have to be elaborate or expensive; it just needs to be thoughtful. Give something that tells your spouse that you listen to them and are aware of what makes them happy. A preferred dessert, a book he/she has mentioned wanting to read, or a flower may be more than enough. The Prophet said, “Give each other gifts and you will love each other.” And, as simple as it seems, smiling when you see your spouse has a positive and heartening effect. The Prophet (SAW) guided us by saying, “To smile in the face of your brother is a charity…” Always aim to be cheerful, uplifting and humorous. Sometimes we feel this is an obligation towards our Muslim brothers and sisters, but we forget to practice this in our daily interactions with our spouses. “Believe” in your spouse: This is absolutely essential in strengthening the marital bond and helping your spouse achieve his/her goals. Khadija (RAA), sets a great example for us. Long after she passed away, the Prophet (SAW) would often remember her and say: “…she believed in me when everyone else disbelieved in me; when they belied me she trusted me; when no one would help me, she helped me with her money. Allah (SWT) gave me children from her and denied me children from any other woman.” Having a positive and loving perception of our spouses has a great impact on how we interact with them. Having a negative perception of our spouses has a negative impact on our interactions with them. At the heart of many marital problems is a poor perception of a spouse, which usually involves our focusing on the other’s shortcomings rather than on our own, letting negative thoughts run wild and building a mental case against the worst aspects of the spouse rather than building an emotional support system for their best aspects. We know that the Prophet’s wives were actual participants in relaying the transformational message of Islam to the world. In this regard, the Prophet (SAW) and the whole community supported them. This has practical implications for us today. Husbands must understand the tremendous need in our society for the talents, creativity, insights, and wisdom of women. What follows from that is providing practical support for a wife to pursue her dreams and fulfill her obligation as an active participant in society. All this, of course, would occur while keeping a balance between the duties of a home and the demands of society. That is giving fullest support to our spouses: believing in their capabilities and helping them achieve their goals. Give your spouse your undivided attention: Spend uninterrupted time wholeheartedly listening to his or her dreams, fears, insights, thoughts, needs or whatever they want to talk about. This also means that we have to create a safe haven in our homes, where our spouses can speak their minds without fear of being judged or ridiculed. When we love someone abundantly, we are inclined to being more merciful, tolerant, and patient with his/her shortcomings. And rahma is the third foundation of a healthy Islamic marriage. Rahma has many meanings and levels. With regard to the spouse, it means having mercy with his/her faults and mistakes as well as protecting and covering their shortcomings. In fact, the root word of rahma is the same as the word rahem (the womb), thereby evoking more intimate, beautiful meanings of mercy. The womb is safe and nurturing, allowing growth without impediment. Marriage should be naturally easygoing and nurturing for both spouses to appreciate each other’s differences and to grow together without obstacle. Spouses live together day in and day out and gradually let most of their guards down. Therefore, they may be very vulnerable and sensitive because their deficiencies and weaknesses are readily visible to the other. One of the greatest ways of showing rahma is being the advocate for your spouse, especially in situations when they are reluctant to speak up for themselves, such as tense moments with the in-laws. Showing rahma with their faults: when something is not major, let it go. When they are weak, sick, or stressed, cater to their special needs and do something extra, such as buying them their favorite foods, taking time off from work to care for them, serving them breakfast in bed, calling them at work/home to see how they are doing, offering warm soup or a nicely brewed cup of tea. Show tolerance and acceptance of your spouse’s extended family and the people he/she cares about. This is a crucial element for any couple and can often make or break a marriage. In counseling, I have seen many conflicts arise from one of the spouse’s lack of attention to their partner’s need to host or welcome their extended family. Be creative about the possible ways to show rahma to your spouse. The key is to stay attuned to their rahma needs by seeking feedback from them about what you can do to assist and make life easier for them. A marriage based on the solid foundations of taqwa, mawadda, and rahma is sure to reap many bounties and blessings from Allah (SWT). In the company of such spouses and insha’Allah healthy and pious offspring, our marriage can truly be the answer to the following supplication: “…Our Lord! Grant us in our spouses and offspring the comfort and delight of our eyes and give us [the grace] to lead the righteous” (Qur’an, Al-Furqan, 25:74). Marriage is conducive to our emotional, psychological, spiritual and intellectual growth. It helps us become useful contributors to society. When we have such peaceful and happy homes, built according to the teachings of Islam, we will live in a heaven on earth. We can have very calm and easeful souls in the middle of life filled with challenges and difficulties only when we believe in Allah (SWT). This is the true joy of living Islam. Kamal Shaarawy Kamal Shaarawy is an author and counselor. His most recent book on marriage is available at SalaamHearts.com.